Description: A vegetable closely related to the artichoke in both taste and appearance and a member of the thistle family, burdock root is a rather unknown vegetable with enormous benefits. Typically burdock is seen in Japanese dishes, burdock root is known for its crisp texture and off-white coloring. 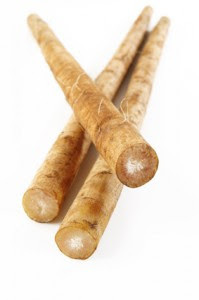 Burdock root is seen to have medicinal benefits and is used very often as an herb to great effect. . Kitchen Pharmacy: Burdock root is used as a medicinal herb and is believed to help blood purification as well as blood circulation. In addition it is sometimes been used as a treatment for the scalp.